* Bass John Relyea [L] has been named the recipient of the fourth annual Beverly Sills Artist Award for young singers at the Metropolitan Opera. The $50,000 award, the largest of its kind in the United States, is designated for extraordinarily gifted singers between the ages of 25 and 40 who have already appeared in featured solo roles with the Met. The Sills Award was created to help further recipients' careers - funding voice lessons, vocal coaching, language lessons, related travel costs, and other professional costs. Beverly Sills, who died in 2007, was well known as a supporter to developing young artists, and this award continues her legacy. 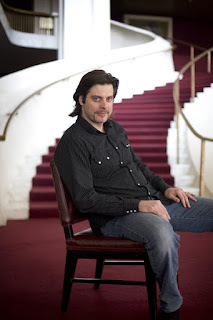 Mr. Relyea is the fourth recipient of the award, following baritone Nathan Gunn in 2006, mezzo-soprano Joyce DiDonato in 2007, and tenor Matthew Polenzani in 2008. * For an interesting account of behind the scenes activities at the Met, check out Judith H. Dobrzynski's article for the Wall Street Journal. Great read.